There’s good reason to upgrade - the new hardware, user sampling, individual outs, and QPER are all indispensable additions. The hardware and workflow are much improved over the MKI RYTM. Now with Digitakt-style sampling, individual outs, better screen/pads. Still ace for electronica and the sound-shaping feats remain unparalleled. Build quality like this comes at a price. The ‘Control All’ mode from the Digi-series is missing. Tempo still can’t be saved per-pattern. Patterns can’t be named. More snare, hat and clap machines? No sample autochop. The first obvious change is hardware. Gone is the dark grey case, replaced by light grey aluminium, tilted for easier use. Its new white-on-black OLED is much easier to read. Next up, the old rubberized clickable encoders have been improved in feel and resolution, while the hard plastic buttons have been changed to the ultra-durable design seen in the recent Digitakt. Like with the RYTM MKI, have the manual on hand, as the navigation can induce some ‘brain ache’ but in general, navigation feels more intuitive on this MKII version. At the heart of the RYTM MKII you’ll find the same excellent eight-voice analogue/digital sound engine as found on the MKI, mated to the familiar 13-track sequencer. Each track is selected by pressing the track button and corresponding pad. The most obvious difference on the MKII’s front panel is that the old backlit pressure-sensitive rubber pads have been replaced by larger, softer versions so you can finally enjoy finger drumming on the RYTM (a huge improvement over the MKI). Entering beats with the pads and changing scenes and performances is much more inspiring and you’ll find yourself relying a lot less on the step buttons to program beats. Also, like the Tempest and the latest MPC’s, the pads light up to reflect their status and similarly, the RYTM also shows different velocity levels and modes using coloured backlights. As well as looking great, this also keeps you abreast of things, even when complex patterns are flowing. Firstly, we’ll mention that the global analogue compressor sounds great and can really transform your beats, helping them pump while adding welcome vibe and drama. You also have sidechain EQ, plus mix, attack and ratio controls at your disposal for dialing in the compression in detail. Next, let’s not forget the microtiming for shifting steps backwards or forwards in time (great for correcting or further slopifying real time/unquantised performances) and of course you have retriggers too for changing up your beats (much like MPC note repeat/sub steps on the new TR-8S). Another great addition is the pair of control inputs to which you can connect external CV sources (modular synths or expression pedals). These inputs can be routed to control several parameters simultaneously and we can see this working well for those who want to tweak stuff live - you could be playing another instrument while using expression pedals to affect several parameters at once (filters, FX, envelopes etc). All told, there’s lots to get stuck into for twisting a basic pattern into oblivion. The sky’s the limit, especially with analogue and samples together. As before, each pad/track can contain one of nine ‘machines’ which are self-contained synth engines dedicated to making a particular type of drum sound. You can configure a pad/track to contain a single machine, a machine plus a sample, or just a sample. 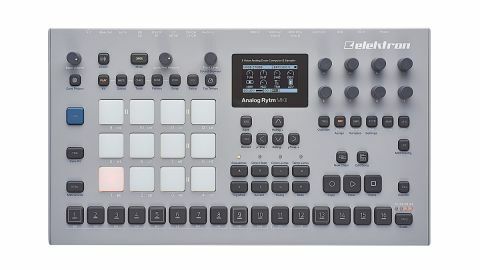 Pad 1 (labelled BD) has now been upgraded to include six kick types (including FM, Plastic, Silky and Sharp) while Pad number 2 (SNR) has four types, along with one type of clap and two rimshot types, both of which use dual-oscillator machines with each having parameters optimised for creating that specific type of sound. You’ll also find machines for low, mid and high toms plus open and closed hats, cymbals (ride/crash) and cowbells. There’s a lot of scope for creating all manner of analogue sounds/sonics from classic Roland-ish stuff to more subby/trippy sounds (though some sounds do take more work to dial in than others due to the number of parameters on offer and some new snare, clap and hat machines would’ve been nice too). Thankfully, the MKII’s flexible architecture allows for further machines/modes to be added and a ‘Dual VCO’ machine is currently in beta. Despite the complexity of the RYTM MKII, the machine concept still takes the headache out of creating complex analogue drums by giving you preset routings. In contrast, a machine like DSI’s Tempest will require you to have some strong prior knowledge of what makes analogue drums tick to get your sound happening - which you may or may not think is a good thing! However, in this case it’s simple - want an analogue bass drum? Select a kick machine, and all the infrastructure is ready to go. Want a snare? Same deal. You don’t have to be a master synthesist to make killer analogue drum sounds here, which means you can concentrate on making beats! It’s also cool that you can push each machine beyond its intended use, so, for example, the BD Machine works as a simple two-oscillator synth which is just about versatile enough for making basic synth basses and leads, especially when in combination with the powerful multimode filter and envelopes. Building patterns (which can be up to 64 steps over four pages with independent lengths) is fun and patterns can be chained or formed into a song too. Note that unlike the Digitakt, the RYTM doesn’t offer external MIDI sequencing so pattern/ song MIDI won’t be transmitted. It’s also a shame you can’t name patterns like on the Digitakt/Digitone but you can at least name kits to keep things tidy. Each pad having a dedicated track still makes sense as you can tap out a beat simultaneously on kick, snare and hats in real-time and each will go to its own track (something the new MPCs now finally have too)! For correcting sloppy performances/ timing, non-destructive real-time quantise can also be set globally, or per-track along with swing (which feels great). This gives you access to semi- or hard-quantised feels per instrument, which is super-flexible. Of course, you still have access to classic drum machine parameters too, including slide and accent (per-step). As before, there are two main modes of pattern building; recording in step mode or real-time. Step mode is simple; hit record and add steps using the square trigger buttons along the bottom of the front panel. The button will then light to denote an event or flash to denote a Parameter- Locked setting. One of the biggest pulls of Elektron gear is the Parameter-Locking which lets you lock multiple parameter changes to every sequence step by simply holding the respective step’s trigger button, selecting the parameter(s) you want to alter, turning the respective encoder(s) and then letting go of the step trigger button. You can also ‘sound lock’ which lets you jump between completely different sounds on each sequence step (on a single track or more), making for hugely complex patterns. In addition, the RYTM MKII features the highly regarded ‘trig conditions’ and a dedicated fill button, which allow events/fills to occur based on probability. So you could have a one-bar beat with the snare on beat 2 only happening every fifth time the beat plays. This gives loads of mileage from just a single bar pattern and greatly extends the flexibility of the RYTM. The new QPER button and corresponding knob also extends the capabilities further, allowing you to quickly select a performance, tweak it, and simultaneously tweak other parameters; this is much improved over the MKI and saves changing modes while beat making, speeding up the workflow. However, we’d still welcome the Digi series’ ‘Control All’ feature which allows global filter/ envelope/parameter changes from one encoder and demands zero setting up before use (unlike scenes and performances). Maybe this mode could be added in firmware? The MKII sounds just like the MKI, which is no bad thing! There’s plenty of low-end extension, punch in the mids and rounded, classy high end. Compared to the Tempest, the RYTM MKII is still darker sounding when using the analogue side but then the RYTM excels at more moody, atmospheric tones. There are also big bonuses with the MKII - firstly that each track now has an individual out on the back panel (which can stream live to your DAW via Overbridge) but the biggie is that Elektron have listened to users and included Digitakt-style sampling (stereo is similarly summed to mono when recording). Simply hit the Direct button, hit Func+yes to record, set source to record from external or internal audio, then add your sample direct to a track or to the sample pool on the +drive. As on the Digitakt, the recorder leaves the main sample intact, so it’s easy to keep revisiting it and pull out more pieces (the sampling workflow is intuitive too). Finally, the analogue overdrive still sounds great, the filters are juicy and versatile, the envelopes punchy and Elektron’s reverb and delay are still some of my favourite built-in FX. The new free Overbridge software (which fully integrates the RYTM MKII within your DAW, due for release soon) will make this even more appealing. The RYTM has been improved in all the right places: a very accomplished drum machine that’ll keep you inspired for years.